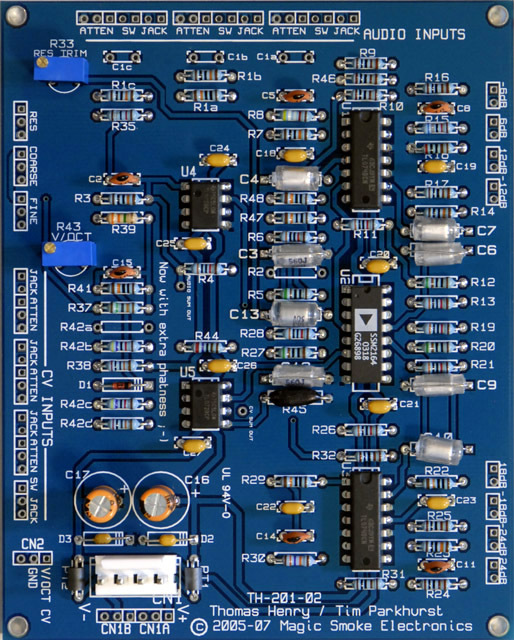 I built a Mankato filter module with a Magic Smoke Electronics rev2 PCB as discussed on the Electro-Music forum. Digikey sells 3300PPM 5% 0805 SMD tempco resistors for about $0.55 each. I made my through-hole 2K tempco by soldering together two 1K 3300PPM SMT tempco resistors and encapsulating them in epoxy. I mounted one lead in my variable speed drill and rotated it slowly while layering fast setting epoxy on the resistors. This shaped the epoxy into a nice elliptical shape. Part numbers are on my parts and construction page. The SSM2164 has a reasonable amount of self-heating and there is a temperature difference between it and the location of R45. I decided to mounted the SMT tempcos directly to the SSM2164 with a small amount of epoxy and wires connecting to the PCB. I've mixed the output of this filter with my A-440 oscillator and have listened to a steady beat frequency for over an hour. There is a slight drift in the first few minutes and then it is pretty solid. I changed the Coarse and Fine potentiometers from conductive plastic to cermet to improve temperature stability. 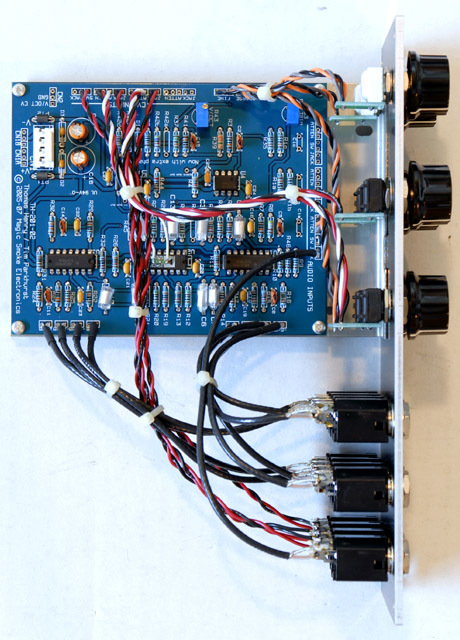 Since this module self-resonates and goes to low frequencies, I want to have all 8 outputs. Here is a my final 2U panel design with standard knob and jack spacing. There is only a single audio input and attenuator. I tried a number of alternative panel designs with closer jack spacing, smaller UEG-style knobs, and a 3U design before deciding on this panel design. I assembled the module with 149 Vishay cermet potentiometers for the frequency controls and 248 Vishay conductive plastic for the other controls. I cut down a 4 potentiometer Stooge bracket as the PCB is slightly wider than a 3 potentiometer bracket. I used shielded RG174U coax for all audio cables and John Loffink's chiclets for the potentiometer connections. 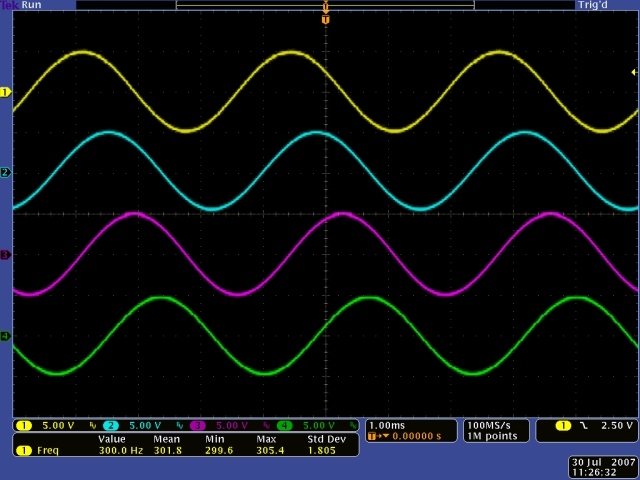 Here's a oscilloscope screen of the four 45 degree outputs when the filter is self-oscillating. This filter is extremely stable. I have verified it against my MOTM-300 VCO and had no discernable drift between the two. The frequency range is very wide compared to other filters. The following are excerpts from various emails I have exchanged with Tim Parkhurst on the filter design and adjustments. 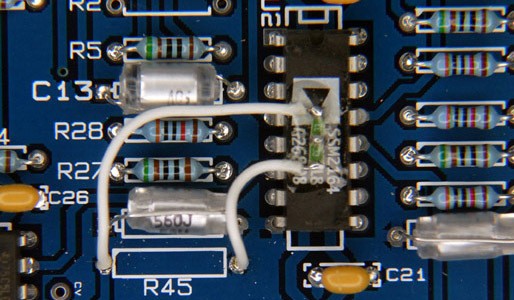 The topology is a 4-pole 24dB low-pass filter. Each pole is separately buffered to provide 6, 12, 18 and 24dB outputs. Thomas Henry spent a lot of time optimizing the SSM2164 for this application and the Mankato has an extremely wide range. The audio range on the coarse control is roughly from 12 o'clock to 3 o'clock , with the lowest setting about one cycle every two minutes to about 22 KHz at the highest setting. This is why you need to set the FM attenuators lower than on most other filters unless you want a very wide range of modulation. You can reduce the coarse control range by changing the value of R37. R2 selects class A or AB as described in the documentation for the SSM2164 chip. There is not much of a difference with this resistor installed. Perhaps it matters more when used in a pure VCA configuration with low line level signals. The resonance trimmer is set to provide the best balance between self-oscillation and sine wave distortion. Setting the resonance trimmer too high will cause sine wave output to distort. The 6 dB output is the most sensitive to this adjustment and you can see and hear a difference as it distorts from a pure sine wave. A small amount of distortion in the 6 dB output will result in smaller distortion in the 12, 18 and 24 db outputs. Setting the resonance trimmer too low will cause the filter to not oscillate or stop oscillating at lower frequencies.